This post was delivered at our farewell community lunch for the August 2016 summer students. As many of you already know, I came to Pardes to learn Torah in honor of the anniversary of my father’s passing. I want to thank all my chavrutot, who so graciously agreed to learn as an aliyah for his neshama. One day, during Nechama Goldman Barash’s Talmud class, while learning about the shema, the Talmud mentions “vatikin” and I was greatly moved because my father A”H started the vatikin minyan in NY, and for over 40 years woke up very early (in winter 3am-4am) to pray as the sun rises. And in that moment, while in the Beit Midrash, I felt my father’s presence. Nechama, through your class, you have fed my soul and in your home, which a number of us were fortunate to have attended, you also fed my body. So it is with my full heart, body, and soul, I thank you, Nechama, for all the time you have given me and for your dedication to all your students and Klal Yisroel. Had I only had that amazing experience, then dayanu, it would have been enough. 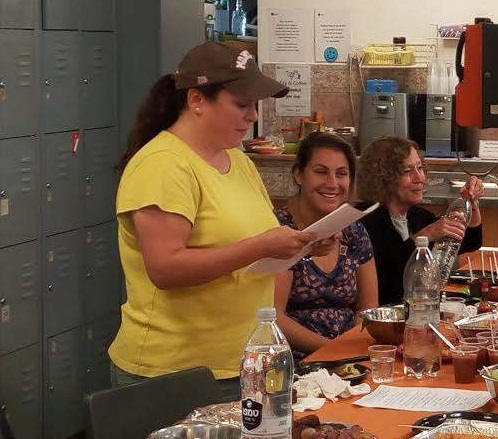 However, in my class with Rabbi Dr. Howard Markose, we learned about the bitter waters and that Moses sweetened it by adding the eitz and I felt that it was a lesson to take to heart – that life is water and at times, it is bitter with hardships, but we should add Torah, “eitz chaim hi,” to sweeten our lives and help us get through life’s hurdles. Thank you Rabbi Dr. Howard Markose, for you have taught me to see the text in a completely new way and I feel blessed. However, finally, Gideon Sylvester, whose class I could not attend because as they say in Yiddish, “ein mentch ken nisht tanzen of tzvei chasunos” (one cannot dance at two weddings) – despite me not even being his student, he so generously gave of his time to help me with a very personal struggle. And through our conversation, I was blessed with some inner peace. It was after this, that I realized that while I had come to Pardes to learn for my father’s soul, that really, my father had sent me here to Pardes to heal my soul.